A couple of months ago this blog was asked to formally open the new complex for the west and north Belfast black taxis in King Street. Unfortunately the talks at Hillsborough were taking place and I was unable to fulfil that engagement. Last week I was able to make up in a small way for that by officially opening Café an Rí – the new café which provides a hot food service for the thousands of customers who use the taxis each day. Dominating the café is one of Danny D’s brilliant wall murals which reflects life in the community. The Black Taxis – some of which are green and red and grey - which service west and north Belfast are famous the world over. No tourist visit to the city would be complete without a black taxi trip. The Taxi Association runs a thriving tour business bringing visitors around the city and giving them a potted history of the place. But its main function is as a transport service for the citizens of west and north Belfast. 40 years ago it was a different story. Belfast was in turmoil. The conflict was at its height, barricades and riots were commonplace. The main roads were regularly blocked and bus services were often suspended especially in West Belfast. Frequently up to 8 people would cram into the vehicle – six in the back and two in the front. If roads were blocked they drove down side roads, over the rubble of riots, along footpaths. Nothing stopped them. Not even the British Army checkpoints. It was a unique solution to a unique problem – providing transport for citizens of this area in the midst of major conflict. The taxis ferried people to and from work and kept families in contact with each other. But it has been at a high cost. Their success meant that they became a major target for the British and unionist state, and an element of the media. The taxi association and the taxi drivers were demonised, and targeted by unionist death squads. As a direct consequence of this 8 drivers were killed in sectarian attacks and scores more were assaulted, arrested and harassed. .
And today there are battles still to be fought against discrimination and bias. But 40 years on the Falls Taxi Association is a blueprint for community economic development. 220 drivers are employed and there are 26 additional jobs. So, I was very pleased on Friday morning to be in Café an Rí – notwithstanding election campaigns – to celebrate the success of this unique, locally based transport service and to meet the families of those who lost their lives providing that service. The heritage of the black taxis is intertwined with the history and experience of our community. As the community has evolved, so has the taxi association. The conversion of the open air taxi ranks into a new complex, and now the opening of a new passenger terminal are signs of forward planning and progress. The black taxi service is a public and community service in the fullest sense. That theme is beautifully illustrated and captured in the mural outside – it says the people’s taxis. This initiative came from the people; it provides employment for people and it is a service for the people. Ní neart go cur le cheile ! The black taxis are not only an element of community life in west and north Belfast. They mirror the community. The taxis were the first public transport service to go bilingual, reflecting our native language and the needs and rights of those of speak Irish. Glor Na nGael recognised this by presenting the taxis one of their annual awards. Now taxis bring people of other cultures to visit west and north Belfast. This visitors bring investment to the heart of our community, and the tours also bring our culture and history to life for them. So the history of the taxi association is a history of community resistance, commitment and success. It is a history which should be cherished. So too the names of those who died providing this service. They are Jim Green, Michael Duggan, Paddy McAllister, Hugh Magee, Harry Muldoon, Caoimhin MacBradaigh, Thomas Hughes and Paddy Clarke. A few days later this blog officially launched an advertising campaign on Black Taxis for the ‘Still Imprisoned Project’ run by Tar Anall. Another excellent example of the Black Taxi Association’s connections into the community. The “Still Imprisoned” project is a direct response to the needs of Republican ex-prisoners and their families. Many former political prisoners suffer from issues as a direct result of the trauma they experienced during the conflict. These include alcoholism, drug dependency, financial management problems, depression and anxiety. The Still Imprisoned Project is there to help. It has been in place for a year and provides a 24hour help line and personal support within a short time. There is a total commitment to confidentiality and respect. 1. "coal face" responders who man the helpline 24/7. The criteria for this group is that they have to have a history of abuse themselves, i.e. be a recovering alcoholic, and they must be Republicans. 2. Professional physiologists, psychiatrists, counsellors and trained psychiatrist nurses who provide support on a voluntary basis. Their criteria is that they must also be sympathetic o republicanism. 3. "befrienders" or "comrade circle". These are ordinary men and women who call in to see some-one recovering and their job is to ease the loneliness and often the guilt which people on the road to recovery face. This is a very important project. It is about helping people who are often in great pain. It is a very selfless act on the part of the voluntary workers who willingly and freely give of their time to reach out to others. As an American who's been a tourist in Belfast, I can personally vouch for the Black Taxi service (I rode in a red Black Taxi!) Your driver will take you to see the murals, show you the peace line, tell you the history of any place you happen to pass, they'll drop you off at the Sinn Féin office (and you can't ask just anybody to do that), and they'll even recommend lodging. 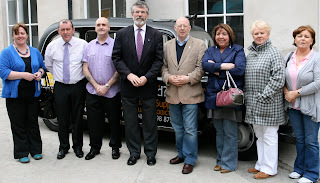 When in Belfast, let the Black Taxi drivers be your guide! There's none better. That's an amazing story. The Black taxi association is a tremendous resourse in the community. In London the Black Taxis have a distinct heritage also, but complaints about an erosion of the service are becoming more widespread, for one reason or another. I enjoyed Alf Townshends book, "The London Cabbie". As a man who plyed his trade on the streets of london for over forty years, he tells some good yarns. The Belfast approach to the Black Taxis is somewhat different and I think you've hit the nail on the head by saying; " The black taxi service is a public and community service in the fullest sense." This is, I believe, key to ensuring the sustainability of the service and maintaining it's heritage also. And remembering those drivers who gave their lives in service is an integral part of that. Sinn Fein na an DUP. A Gearoid, congratulations on becoming the biggest party overall. Maybe time now for SF to have a strategic look at itself and its role in Northern Ireland for the next two decades, its relationship with the SDLP, the forging of cross-community cohesion, putting Northern Ireland - green and orange - first, resolving the Janus posture which attracts tribal loyalty from one side and dreadful hatred from the other and dealing constructively with Westminster which will be a fact of life for a time to come. 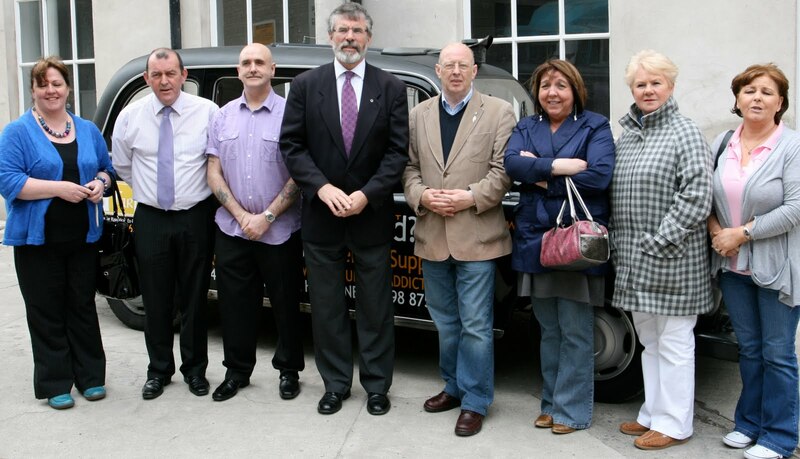 It was Jimmy Maguire from Maguire's Garage on the Falls Road who thought of bringing the black taxis to Belfast. He bought hundreds of cabs in from a taxi firm in Fulham in London. At the time money was very short. Some of the men had just been released from Long Kesh and the drivers paid their vehicles off every week in the garage. And that's how the Black Taxis began on the Falls Road.